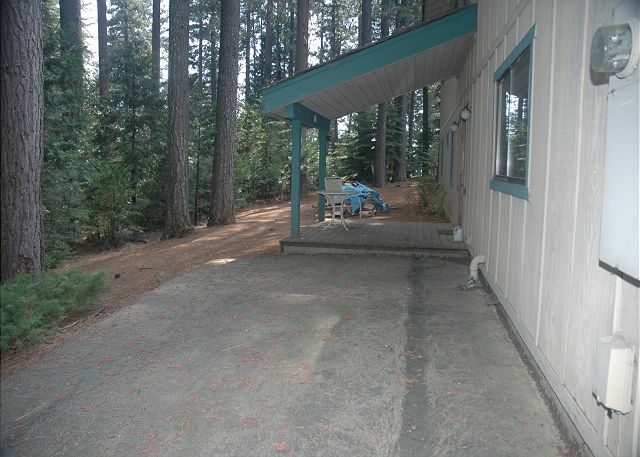 Spencer Cabin offers easy access and plenty of parking. The side porch is a great place to enjoy your morning coffee and the peace and quiet. Lots of covered room in the winter to park boots, sleds, snow shoes, etc. 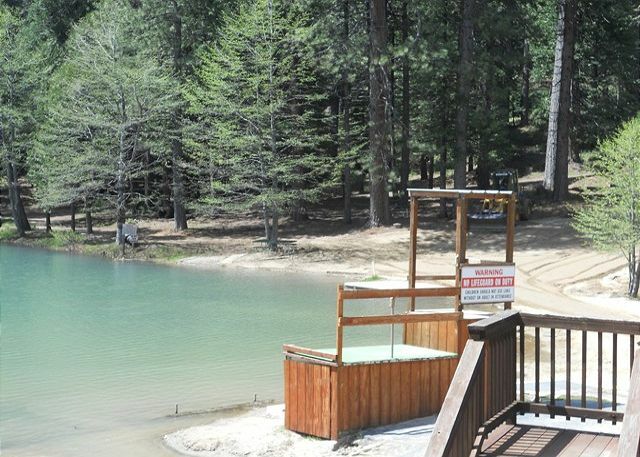 Cabin rental includes the use of Blue Lake Springs Rec Center in summer months. 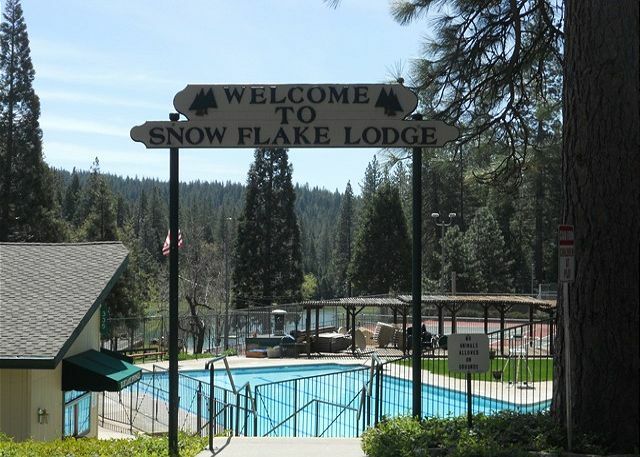 Enjoy a great meal at Snow Flake Lodge after a swim ! 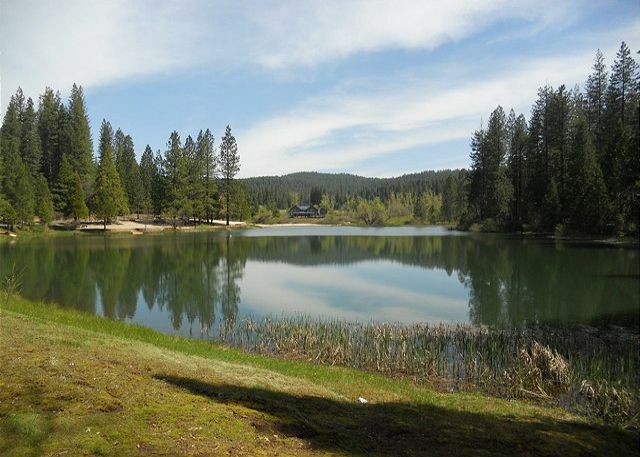 One of the private lakes available at the Blue Lake Springs Rec. Center - perfect for families ! 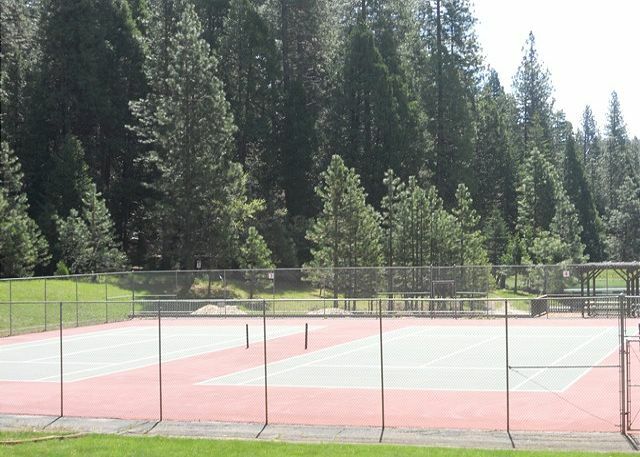 Tennis Courts are also available at the Rec Center Use of Fly In Lake during the summer is included with cabin rental also. Spencer Cabin has a cozy living room with great views, plenty of seating - even a card/puzzle/game table. Living room view from the wood stove. The well stocked kitchen with in kitchen dining. Enjoy views of the outdoors while enjoying your meals ! One of two bedrooms on the main floor - with a King bed and cable TV. The second bedroom on the main floor - with a King bed,cable TV and bright decor. The master bedroom on the second floor has a king bed and cable TV and VCR unit. Wake up in the trees in the second bedroom upstairs. This room has a king bed, cable TV and a private balcony. Lots of wood in this bedroom makes the mountain experience complete. The airy and bright loft offers a great place for kids to hang out. There are two bunk beds and a twin sleeper sofa in this room. This room also has a TV with VCR/DVD player. There are so many wonderful places to explore in our beautiful Pass. Come discover your own favorite ! If you are looking for a cabin in the woods that will sleep 8 adults and all the kids, this is the place. The cabin was clean and comfortable. We are so glad to hear you had a good holiday. The Spencer cabin is great for family getaways. The home was perfect for 4 families, very quiet location, the rec center was a blast and awesome bonus, the kids enjoyed the talent show. Going over to big trees and relaxing. Thanks for sharing your home with us. We are very glad you enjoyed your visit and hope you will stay with us again in the future! Our family stayed in the Spencer cabin for our son's wedding. We had 4 married couples and 4 kids 4 and under. The cabin was more than big enough for all of us. Not often do you get a choice of 4 king sized beds! plus more. We hosted a brunch the day after the wedding and had more than enough room for all to sit and eat. The only draw backs would be a little mold build up in the master bath upstairs, cobwebby windows and the kitchen stove really needs to be replaced. The burners do not all work properly. Great location and plenty of parking. Spacious place with lots of bedding (4 king beds!). Was disappointed with the stove, original installation (antiquated) with only one of the four burners that would work.